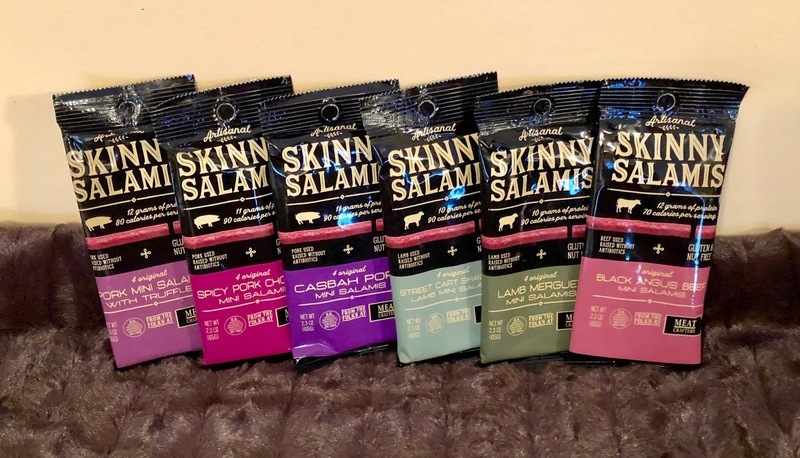 Meatcrafter’s Artisanal Skinny Salamis is an on-the-go snack that’s high in protein, low in calories, and gluten-free! Every package of Skinny Salamis is made in small batches of the highest quality meats (Duroc Pork, Black Angus Beef, and All-Natural Lamb) and the finest herbs and spices. They are slow cured, antibiotic free and have no added hormones. That's what makes them perfect for an after workout snack. They help replace all those things you burned off while working out and give you a little extra pep of energy to keep on going! I recently had the opportunity to receive a package of each flavor from the line to try out with my family. We are big beef stick fans so for us this was a real treat to try some that is actually good for us and in different flavors other than just plain beef. Of all the flavors my favorite is still the Black Angus Beef. There's just something about a pure beef stick that hits the spot for me. My husband on the other hand was super exited to try and really liked the Spicy Pork Chorizo. He's my spicy man of the house so for him this was a real treat! Flavors: Skinny Salamis comes in Pork Mini Salamis with Truffles, Spicy Pork Chorizo, Casbah Pork, Street Cart Shawarma, Lamb Merguez, and Black Angus Beef. Buy it: You can purchase Skinny Salamis on Amazon in multi or individual packs.